One of the favorite things Mom ever heard about the Kuvasz and roaming was, if you have an acre of land, after a week with a Kuvasz, you will have two acres! They love to keep expanding their territory, and I’m sure the Pyrs are the same. Katie did some barking, but she mainly barked from dusk to dawn thankfully. Now that she is older, she rarely barks. I enjoyed my pyr’s barking all night long. He roamed our land & I always felt secure because I could always tell where he was. Of course it was a very sad day when he crossed the rainbow bridge but I’ll always love him even if he is heaven now & waiting for me to come home. Haha… my GPs are outside barking as I read this article. I love them so much. I totally agree with the night routine. I bring mine in at about 9:30. They shuffle around the house for awhile, bark off and on until about 11 or so when I go to bed. Then they settle down. Sometimes they bark late after that, but it doesn’t bother me. I do believe that their size and bark would be intimidating to a potential intruder. If you can sleep with the tv on with very little volume they get used to noise and it helps a lot. I’m on my 3rd pyr and they sleep with me and never disturb except in emergency. Rest assured they will definitely attack if you are in danger even if you may not realize it. Their instincts are better than ours! Your article is right ON!! Thanking Hiro for doing his job and letting him know “we got it” was a game changer. He loves his bedtime routine. And I use youtube “ocean wave” videos as white noise. I was pleased that I instinctively had used many of your suggestions. We have bedtime treats and closed door at night with a fan going and it is usually enough to keep the barking at bay at night. My mom trained our pyr to go outside to bark. Of course his interpretation of go outside was to stick his head out of the pet door to bark. Needless to say this gets lots of laughs and comments when we have company. MY Pyrs Storm and Meeka bark all the time,I Tell them good dogs they stop and lots of tail wagging,best dogs ever. Ha! We do the same thing with our 6 year old Pyr, Bailey at night. She’s shut in the bedroom with us after her nighttime potty walk. We have a small fan on for white noise even during winter. She sleeps the whole night and I never worry about anyone breaking in as I can’t even sneak out of the room without her knowing! She’s definitely our guardian angel! I have an eighteenth month old Carpathian Shepherd , Dobby.He was the has the same behaviour patterns and is also a Livestock Guardian Dog.And yes he does all the barking I have found that praising him is the only way to get Dobby to quiet down a little. I found the article very helpful.I certainly feel very safe with Dobby to guard me I also have a seven year old Alaskan Malamute they are great talkers and when they both start to talk it’s so loud. They both sleep in my bedroom at night and although I live in the country I feel totally safe with them to protect me. I think I will try the bedtime song. I’ve been thanking our GP since day one. However, he only responds to that for a few moments. If something else catches his eye or any of his other heightened senses, it’s all bets off and we start all over. He will not come inside. We have wood floors and he doesn’t like the texture. Nothing will coax him inside and he is way too big to be lured. Plus, he is here as a hired hand. We have chickens and mini goats and horses for him to protect. Even if we could get him in at night, then he wouldn’t be able to do his job. He’s a natural guardian, but barks at EVERYTHING. When I go out to see what he’s barking at and validate him, it seems to encourage the next alarm even more….he won’t stop until I come out to thank him! My neighbors have been very patient, but I am losing mine and need uninterrupted sleep soon. I haven’t been able to find any advice or support on a rural working dog and continuous barking. I’ve tried everything I can get my hands on and only had limited success. Being rural with neighbors only a couple of acres away makes it tricky. My hens and goats need his protection at night mostly, so I don’t want to bring him inside – plus he hates even the concrete garage & driveway texture. How do I keep a happy dog and happy neighbors (& get some sleep myself)? Exactly my problem–I need Sophie outside because of predators. PLUS with my arthritis & balance problems I cannot go outside in the dark, bumpy land to thank her. Would a collar that prevents her from lifting her head to bark help?? What would “de-barking surgery do to her psychologically? She is four. She also keeps racoons from coming in cat door if outside. If inside, she barks a lo also, Particularly whenever another large dog barks in the rural distance. omg I have not slept in 3 days, my pry didn’t start this non stop barking until he turned 1 year old, now night time he won’t stop barking. im in the rural country side, but my neighbors are mad. stopped talking to me because of my pry barking, I bring him inside and he still will not shut up. our family has to get sleep for work in the morning. 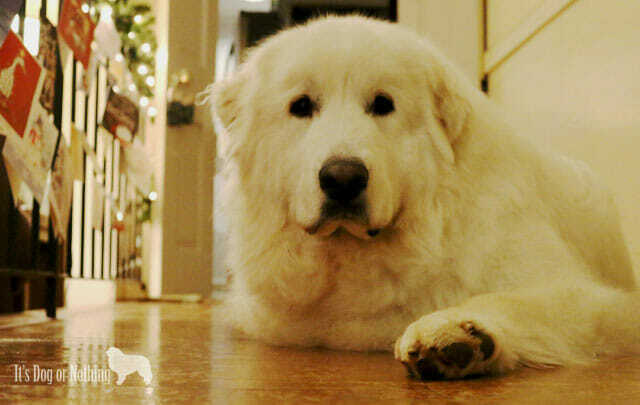 I am afraid I have to surrender my pyr. . we need sleep!!! does anyone recommend a shelter to take him too. I was told from my cousin that her pyr is not nocturnal, so I believed mine would not be either, I was wrong. they are not all the same. 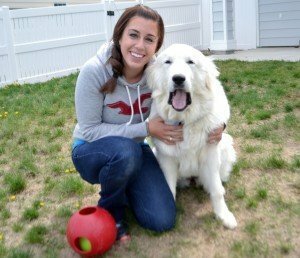 Great article and so important to educate people that love the beauty of the Pyr and know little about them. In our case, our Sebastian, 8 years old, will be mostly quiet all evening, until we turn the lights out and his fan on (of course) and all the bedtime routine..as soon as our light goes out, he starts his barking. We say he’s letting everyone know that he is now officially on duty for the night. He’ll quiet down at some point, but we pretty much sleep to it knowing that all is well in his normal bark. I also love that when I’m home alone, I never have to worry. Love our Pyr! I have two. the female, Freyja is on constant high alert! she patrols a 3AC fenced pasture. She has alerted me to coyotes, fox, turkeys, frogs and rogue leaves and chicken feathers blowing in the breeze. The male, Odin prefers to wait quietly for any predators, with the goats by the barn. Occasionally joining her if she sounds really frantic, but he rarely has that barking frenzy. They are both just over 1 year old and I don’t expect to see any big personality changes. I love them as they are,& think they work well together! I can sleep well at night knowing those chicken feathers will never get close to my goats!! Our Great pyrenees is mixed with border collie she is the sweetest dog I’ve ever had. The only thing worse than Mack’s barking is his snoring. OMG he rattles the windows. I’ll bring him in if he’s particularly barky (he actually is a LGD for my horses and is out 24/7 doing a superb job). He lies down on his bed in the living room and his snoring then keeps the whole house awake and probably some neighbors as well. And I wouldn’t change a single thing about him. Mackie is the best dog EVER. Mine bark all the time but I wouldn’t have it any other way! They are my girls and I love th like my own kids. I love my Pyr/ lab rescue pups, Dallas and Denver. They bark but once they are in their crates at night, silence. They only bark when outside very rarely in the house. Dallas will bark inside when he wants to go outside. This is our first time with Pyr/ lab pups and it’s been great. No they don’t roam, we have an electric fence, yes we have holes and they’ve rearranged our garden to their liking. Would love to rescue another but all are requiring a fenced in yard. We had GS dogs for the last 14 years, took a break due to their crossing the bridge and other family issues. I keep a routine at night for them and it works, only time it doesn’t work is when our daughter comes home for a visit. She wants them with her all the time ! I wouldn’t trade these two in for anything, barking, hole digging or whatever, we love them to the moon and back. There our reason to keep going on. Ohhhh I am thrilled with my Pyrenees, Woody. Woody is a soulful loyal fur-ball. He rarely barks and when he does, it’s because he is letting our Anatolian know he’s available if need be. I’ve owned the ASD for seventeen years, my first Pyrenees’s was adopted in November 2015, and I couldn’t be happier. I could own 10 of Woody, as long as they were just like Woody though. Woody will roam sometimes and also take off after a herd of deer. It’s so funny how s-l-o-w he walks until he spots a deer or some other creature , then he’s like Usain Bolt, the Olympic runner. 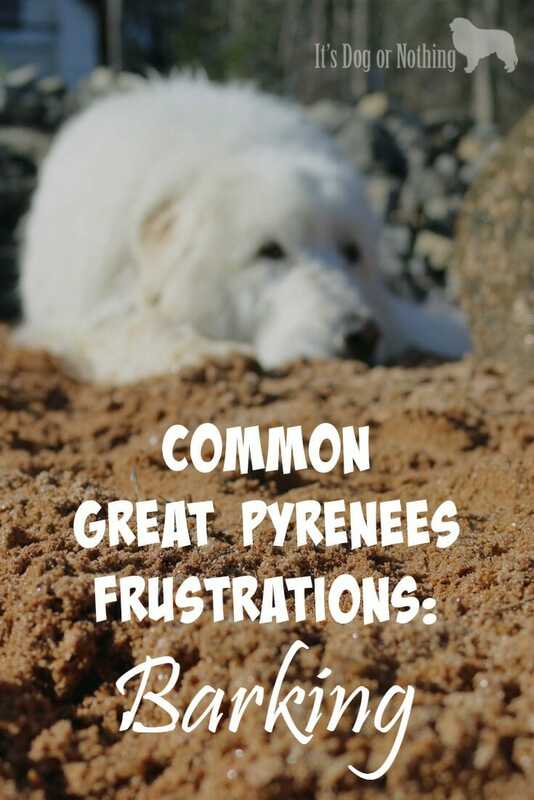 I consider myself very fortunate after reading lots if the information regarding the Great Pyrenees. One thing that drives me crazy is that Woody loves laying in the mud. OMG, it drys and I vacuum up the dirt. His east is that. When I first got Woody, we were bathing him not knowing better and the following day he would be twice as dirty. Learn through experience I guess. Thank goodness he doesn’t bark a lot, but my Anatolian got that covered, he barks all day except when he’s eating. Live my fur-balls, Woody the Great Pyrenees Mountain dog and Brutus the Anatolian Shepherd Dog, both adopted together from Big Heart K9, in Lancaster Ohio. I just got a Pyr puppy. A bit spontaneous, but I researched the breed when the opportunity to own her came up. It’s only been three weeks, and she is 11 weeks old now, and I’ve been thinking, where has this breed been my whole life? Now I’m worried because she is just starting to bark. She is an indoor dog, and already has a bedtime routine. Her barking consists of about 3 loud barks every time someone comes in the door, or even if someone comes down the stairs (of of our 4 teenagers, for instance. Really?) I can handle this, but I’m worried it’ll get worse. I’d like for her to be a therapy dog and plan to socialize her a lot. We’ll do whatever it takes to make it work. I can’t imagine my life without her how! We adopted a female 2 year old that had been through 4 previous homes. She is a great dog and yes she barks a lot, especially at night. We have 6 acres fenced off, so she can run at night and bark all she wants as the closest neighbour is a half kilometer away. Her previous homes were all in suburbs. At night, I can tell by her bark which part of the property she is on and I don’t mind the noise as it is rarely close to the house. Coyotes make a lot of racket too, so her barking is not out of place in the country. Another problem is fence height. We have vinyl horse fence that is almost 5 foot around half of the property and cedar posts around the rest with 4 foot goat fence attached all the way around. Guess what. A Pyrenees can clear four feet, especially with a deer clearly visible on the other size. We had a two year old male that cleared the fence twice last year. He died of seizure clusters despite being on his meds and going to the emergency vet. Now we have a 6 month old male pup and I am raising the fence to five foot all the way around by adding a layer of fencing at the top. Do not underestimate a Pyrenees ability to jump. Great dogs, but you need to accommodate their idiosyncrasies. We had finally gotten to a good point in our routine where our Great Pyr, Dolly, was only barking a few big barks a night, but then my work schedule changed after I got a new job and Dolly is not a fan! I used to get up for work at 4:15am so now she goes bananas at 4:30am on the dot. Every morning, without fail. It’s like she’s trying to wake me up to tell me that I’m late for work! lol! My husband is always able to calm her down with pets and belly rubs (she refuses to sleep on her nice bed and instead sleeps on the floor on his side of the bed so that he can pet her). She’s such a sweetie and I know that this time will pass by and she’ll get accustomed to our new routine, but for now… We’ll have to withstand the 4am barking! Well I hope to heck that you people who enjoy your dog’s barking, don’t have neighbors! It is so inconsiderate to have an LGB that barks non-stop, and do nothing about it! My neighbor and I had to put up with one of those dogs for over a year. The people finally moved. Then another neighbor got the same @@###%#$ dog, and even though it keeps us awake all night long, they do nothing about it. They are protected by our corrupt county because they have a commercial pot grow and a couple goats.I’m out of my mind! He barks all night and all day, it’s out of control! I’ve lived here 25 yrs longer than those people and I’d love it if they had to trade places with me.I’m always home and have a stressful life as it is. They are literally taking years off my life. Please be considerate. Don’t make someone’s life a living hell because you like your dog! Please!!! Thank you for sharing! It’s very helpful for me. 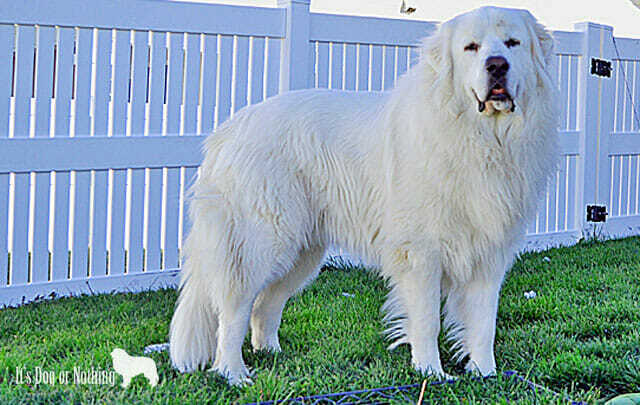 I always want to have a Great Pyrenees, gonna prepare before taking one home. Thanks for sharing the love and advice. I would love to accept her barking but I live in a neighborhood with lots of neighbors. I have had the dog warden to my home on three occasions since I adopted Myka. The next time is a hefty fine and the time after that they state they will remove her. This is for her daytime barking which is mostly when there is another dog being walked and we have a lot of dogs here. I do give Myka melatonin at night and she does sleep through quietly, which she did not at all prior. Just as an aside I was told by the adoption group that she was a Newfie mix, she is certaintly not, definately a GP. After losing several goats to coyotes and trying every recommendation by various agencies, including Fish and Wildlife. I decided to get a Great Pyrenees, Sadie is now the queen of the farm. She killed her first two coyotes at 14 months old and never got a scratch. She watches her herd that is ever growing faithfully, she loves the cats and her fur brother and sister that live in the house. She is one of the most affectionate dogs I have ever owned and now two years old loves to play with me, which for her is a running charge that will knock me down if I am not ready. She is at over 100lbs and eats very little for her size, each morning at sunrise she is sitting in the field where she can see the kitchen window, she has learned my routine and knows that I will be making coffee. As soon as she sees me, she will go sit at the gate and wait for me to come let her into the yard so she can check around for strange smells that weren’t there the day before. She does bark from sunset until sunrise and that lets me know she is on patrol. We were about at our whits end with our pyre barking almost constantly, we were afraid our new neighbors hated us. The best thing that has helped our great pyre with barking has actually been a shock collar. Now, before judging, let me specify that we do NOT use a BARK collar…we still want to encourage our dog to bark when needed and still fulfill his natural instincts, but the shock collar can be controlled by us when we deem his barking excessive. We don’t use the collar very often, and almost never use the shock setting, but a beeping setting to just give him a startle. Since the first time using it, it has worked wonders! We have only to give him a little beep once and he knows to chill out for a while. It has been the best option for us. Less time being stressed and more time to love and enjoy our dog. What type of collar do you use ? I live in suburbs and my neighbors are not happy. I need to find a solution fast. I love my baby boy but he will not stop. He’s 11 months old now and very loud. I have a 4 yr old GP. She’s an awesome dog is great with my toddler like will let her climb all over her (I don’t allow it but I know if I’m out of the room she’ll let her do it or just get up and walk away) she barks tons outside during the day but very rarely at night. And never barks in the house. Once she barked in the house and that’s cuz she could see a dog in our front yard. I told her thank you for letting me know and she laid back down. Just a just dog. The hair I could do without. Breeze on May 9, 2018, went to sleep and never woke up. She died of a massive stroke. i went to ask her to move off the sofa as i wanted to put my legs up…she didnt move. i was devastated. Went into a trauma depression i did not get out of and honestly wanted to end my desperate life. best friends were so concerned, Bonnie got on the web, up pops a “Pry” up for adoption that day. it took me 10 minutes to research the breed. he is 1 1/2 yrs old i am so in love with him . he truly does not bark….is so friendly and loving, loves to meet new people. what else can i say to you PYR owners? you are so aware how remarkable this breed is..
i have laughed and laughed over all the ‘MY PYR’ NEVER SHUTS UP. I am so hoping that “Chunk” never finds his bark. even tho he is the rare exeption he is my guy and saved my life. he is perfect!! 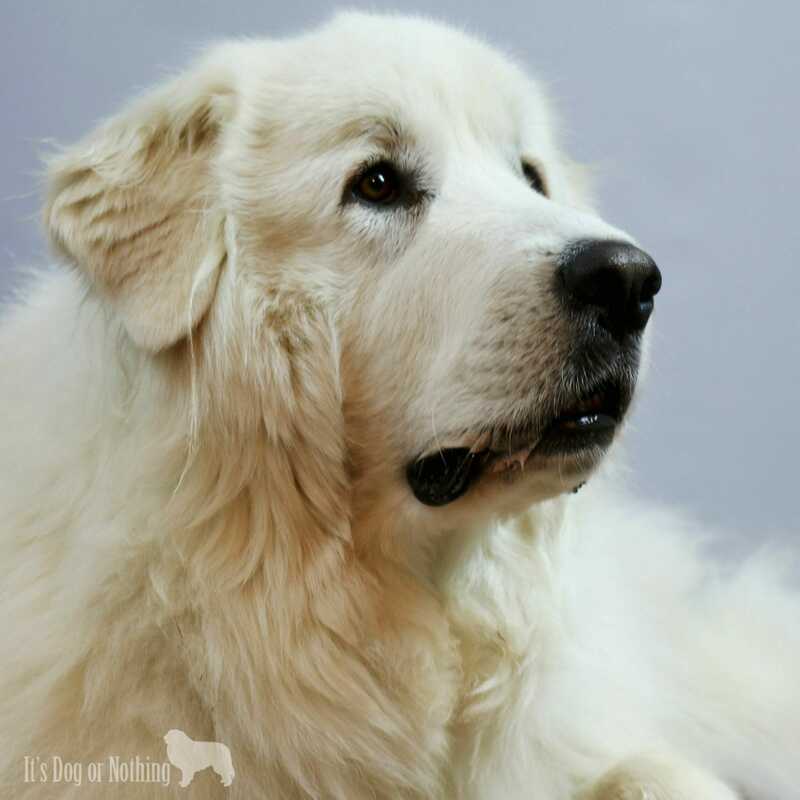 Hi Sherri, I always wanted a Great Pyrenees and found Bella at an animal control. She had been there 2 months and returned once because they had older dog and she was too rambunctious. She is 1 1/2 and just a big puppy. We are a retired couple at 66 & 67. The first month was a learning experience and we was tempted to take her back but she has so much character. We have an acre of fenced yard she loves it plus we walk her everyday and dog park once a week. She has a blast. Were trying to socialize her because she wasn’t. I’d love to rescue another so she’ll have a companion. She’s our baby now!! Our Great Pyr is 18 months old and lives on 5 acreas. He has 20 sheep, 4 chickens, 2 horses and 2 labs to protect. He has been a great dog, but lately showing signs of aggression which worries me. He started jumping up on 2 legs and pushing on the horses. It happens when the horses come too close to the house, too close to me and when I’m feeding the horses. It almost looks like he is trying to keep them from their feed. I don’t understand why he is doing this. Last night, he attacked my yellow lab. This happened twice before when he was younger. There is nothing going on to provoke this attack. It appears as if he doesn’t recognize him which is ridiculous since they are always together. I wish I knew what was going on in his mind with this aggression towards. I appreciate any advice you may have. We just adopted a 2 year old GP. He is a great pup. Very well mannered and doesn’t “bark” that much so far. But he does start howling randomly sometimes. What do you suppose he is trying to tell me? Most of the time, it seems like he does it when he notices someone or our other dog is not in the room. But last night he started howling and seemed real nervous. Almost like he was scared. Just seemed odd. After I calmed him down he just wanted to lay next to me. Just curious. Thanks in advance!